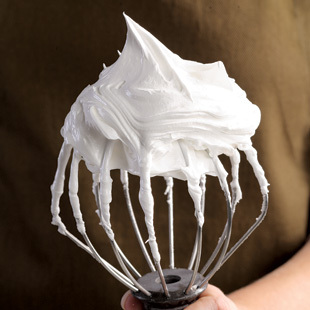 Making the perfect meringue is easier than you think. 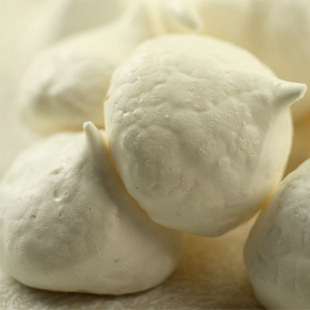 Light, delicate and delicious, meringues are low in calories, and our basic recipe takes only 15 minutes to whip up. 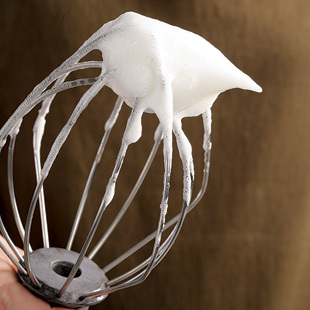 Beating Tip: To get the most volume from beaten egg whites, it's best to start with whites at room temperature. Submerge them in their shells in a bowl of lukewarm (not hot) water for about 5 minutes before using. Position racks in the upper and lowers thirds of the oven; preheat to 200°F. Line 2 large baking sheets with parchment paper. Place a small amount of the meringue under each corner of the paper to secure it to the pan. 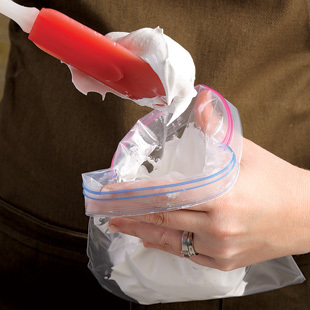 Fill a 1-quart seal-able plastic bag (or pastry bag fitted with a ½-inch plain tip) with the meringue. Seal the bag almost completely, leaving a small opening for air to escape from the top as you squeeze. 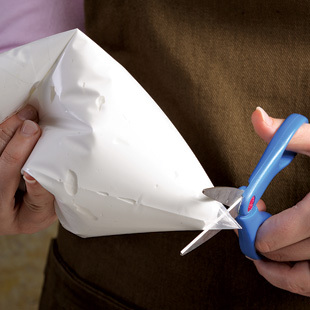 Snip off one corner of the bag with scissors, making a ¾-inch wide opening. Fold the top of the bag over a few times, then gently push the meringue down to the snipped corner. Working with the bag perpendicular to the baking sheet, pipe the meringue into 1½-inch diameter cookies, spacing them about ½ inch apart. To Make Ahead: Cookies can be held at room temperature in an airtight container for up to 5 days or in the freezer for up to 1 month. 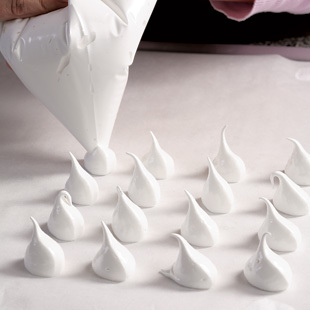 If stored meringues are chewy, bake at 200°F for about 10 minutes to restore their original crisp texture. For these meringues, use Dutch-process cocoa, which has a mellower flavor than American-style. These tiny, lemon-flavored meringues must be cooked slowly so their outsides are powdery and crisp, while the insides are chewy and yielding. Serve with sorbet.